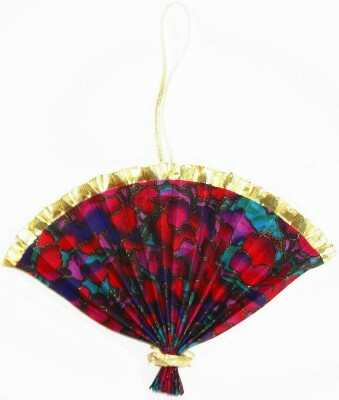 Folded Fabric Ornaments - Fans! These images are copyright protected by Debbie Jones © 2019. All rights reserved. Interested in learning to make ornaments like these? Check out the Store page for info about the patterns. 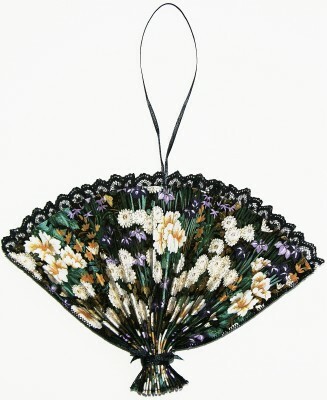 Check out the Store page for info about the new pattern. 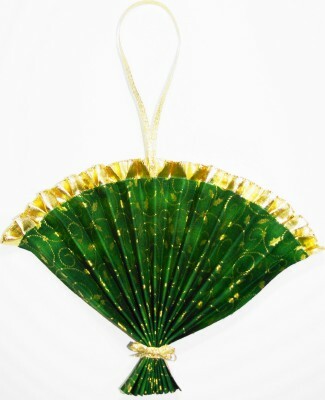 Click here to return to Ornaments Page 1. 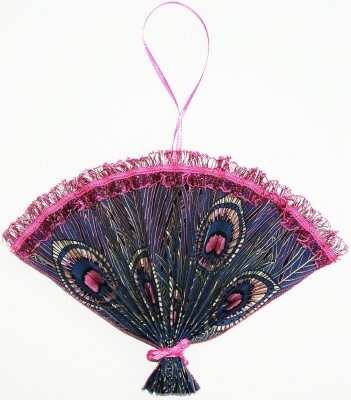 Made with cotton fabrics, including a batik print on the left, this reversible ornament can be displayed year round, as both sides have non-holiday designs. Trimmed with pink ribbons. Looks nice hung in a window or on an easel. 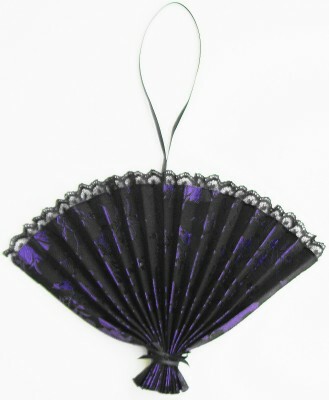 This reversible ornament is made with a silk brocade fabric on one side, the black and purple design on the left above, with a cotton print on the other side, as shown on the right above. Trimmed with black lace and ribbons. 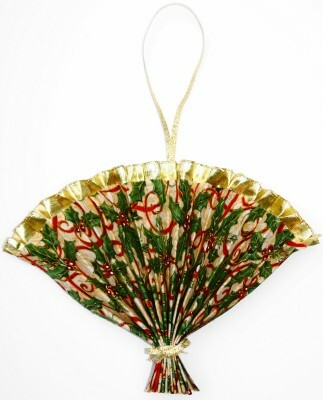 The photos don't do the ornament justice -- it's a very elegant Asian fan! The fabric on the left above is a cotton print with silver stars, a beautiful Hanukkah piece! 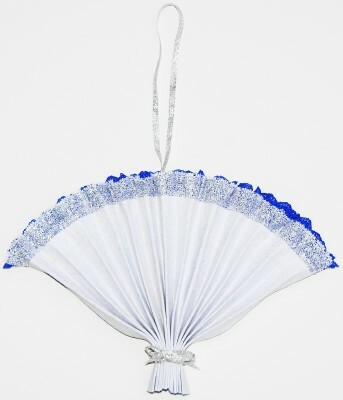 The reverse side of the ornament, as shown on the right above, is another blue and silver cotton print. 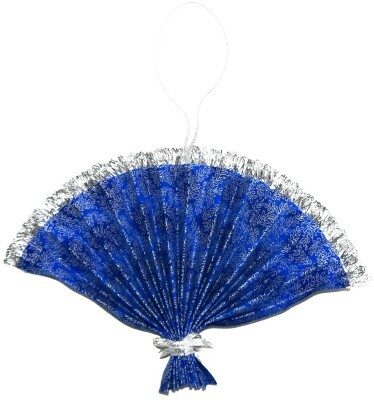 With silver trim and ribbons, this is a sparkling holiday ornament! 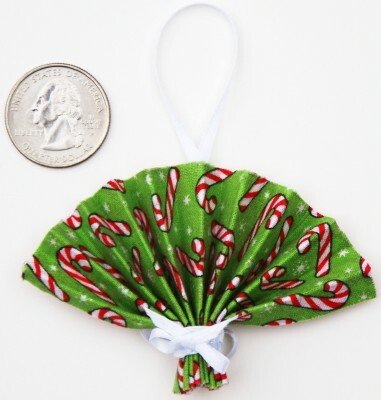 This tiny fan ornament is pictured next to a quarter, to show just how small it is! 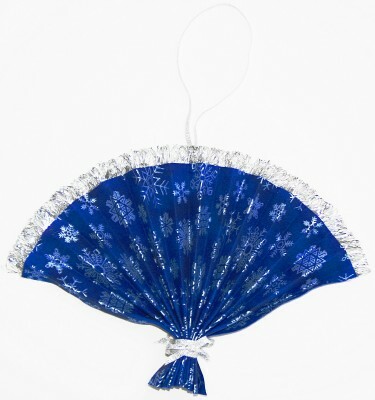 Made with cotton fabrics, it's reversible, with another Christmas print on the other side. 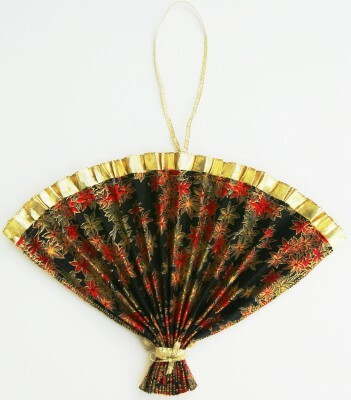 Here is another Asian-themed ornament, with the gold fabric a silk brocade and a cotton print on the reverse side, as shown on the right above. Trimmed with gold ribbons. 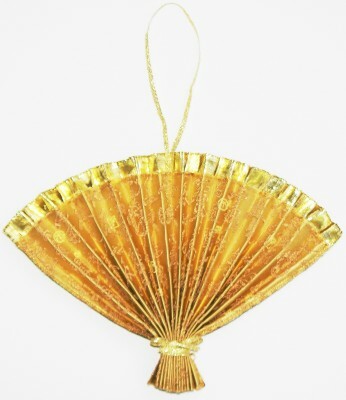 On both sides, this ornament is made with cotton fabrics that have gold highlights and then trimmed with gold ribbons, for a sparkling addition to any Christmas tree. 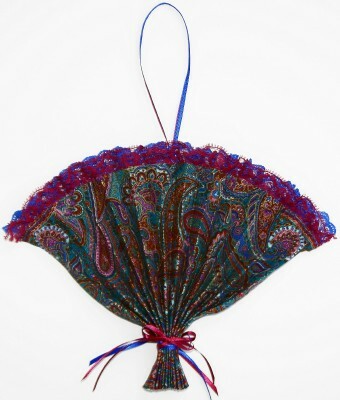 For this reversible ornament, the fabric on the above left is a cotton paisley print, with a red and blue woven cotton lamé on the other side, as shown above right. 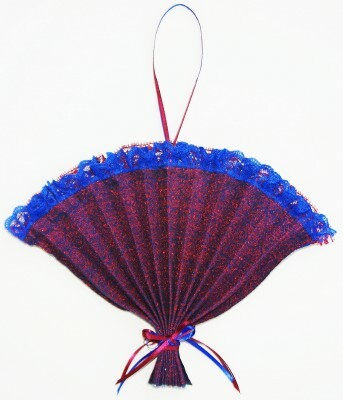 Trimmed with deep red ribbon trim on one side and blue ribbon trim on the other side, along with both red and blue ribbons for both the top hanger and the gathered ties at the bottom. 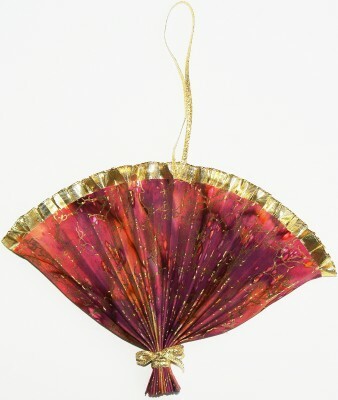 This vividly colored ornament has a bright cotton print with gold outlines on one side, as shown above left, and a batik with hold lines on the other side, as seen above right. Trimmed with gold ribbons to highlight the gold in the fabrics. 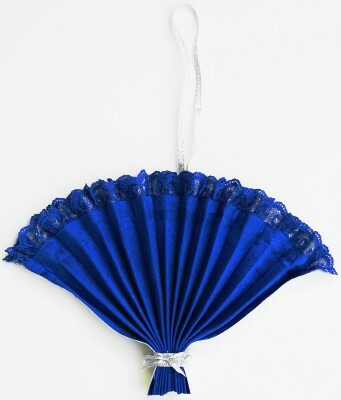 Made with solid color satin fabrics on both sides, with blue and silver ribbon trims, this reversible ornament is bold and elegant at the same time. Who says you have to use prints? !